jiite, .j rr ii II U IJ j, li jj ji:NHU'J I* JJliiU JJ-. and cost-effective grid Energizing a world that demands more Eaton brings a new dimension of expertise to help utilities improve reliability, drive operational efficiencies and reduce costs. Utilities rely on Eaton to help them protect people, processes and the environment with products and solutions that can enhance every aspect of their business. 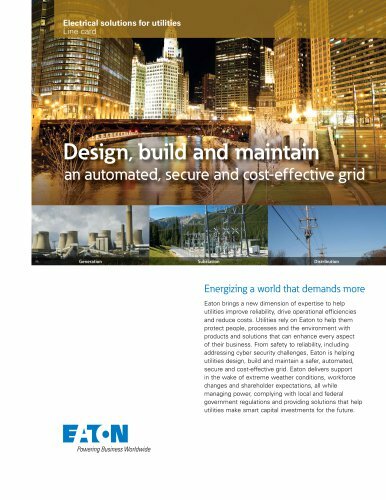 From safety to reliability, including addressing cyber security challenges, Eaton is helping utilities design, build and maintain a safer, automated, secure and cost-effective grid. Eaton delivers support in the wake of extreme weather conditions, workforce changes and shareholder expectations, all while managing power, complying with local and federal government regulations and providing solutions that help utilities make smart capital investments for the future.